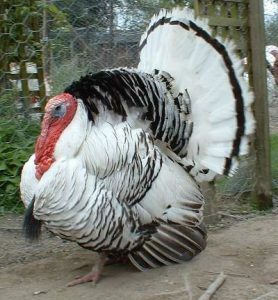 The Pied turkey has been in existence in Europe since the 1700s. It is very ornamental and a popular exhibition bird. The Pied is more suited as an egg producer than meat bird. Neck: White with every feather ending in a fine black edge. Back: White with metallic black over saddle, fringed with white. Tail: main tail: pure white with a wide black band across each feather near the end, terminating in pure white at the tip. Coverts and lesser coverts, white with wide band of metallic black extending across the feather near the end, terminating in a wide edge of white. Wings: fronts and bows – white with narrow edge of black across each feather. Coverts, white with narrow edge of black on end of each feather forming a black band when wing is folded. Primaries, dull black. Secondaries, white with exposed portion of each feather having a black strip running about 10cm (4 in) in length on each feather; becoming shorter on top secondaries to form a distinct spot on each feather. Breast: Exposed portion of each feather pure white ending in a band of black to form a contrast of black and white giving the effect of scales of a fish. Body and Fluff: body, white with each feather ending in a black band terminating in white. Fluff, white. Legs and Feet: thighs, white with very light black edging. Shanks and toes, in mature birds, deep pink; in young birds, pinkish-white. Undercolour of all sections: White. Absence of black edging. Absence of black bands in main tail and greater coverts in both stags and hens. Any brown colouring. Poults are a yellowish white throughout the body. Pure white feathers grow through the down and black markings begin to appear at around 6-8 weeks. There are other varieties which have similar colouring, such as Ermine Ronquières (Belgium), Royal Palm (USA).